Past experiences are keeping the farmers of Punjab skeptical of political will, ahead of the general elections. Recent farm loan waivers and income support schemes are far removed from ground realities and thus inspire little confidence. Declining production, market volatility, ecological loss, and unpredictable weather have all been contributing to farmers’ heavy debt burden, harassment and suicides in Punjab. In January this year, farmers across the state of Punjab took to the roads in protest. In 12 districts of the state, they were protesting against banks that filed cases against loan defaulting farmers. Also part of their demands from the government was compensation of Rs. one million (Rs. 10 lakhs) each for families of farmers, who committed suicides, as well as minimum support price (price at which government purchases crops from the farmers) for all vegetables and fruits. During the same time, sugarcane growers in the state were blocking highway traffic in protest. Sugar mill owners had not released their dues that amounted to Rs. 3.96 billion (Rs. 396 crores). To make matters worse, unexpected winter rains damaged the potato crop across the state, dashing any hope of recovery in the three-year downslide plaguing the spud market. This is a snapshot of Punjab’s farm crisis. Declining production, market volatility, ecological loss, and unpredictable weather have all been contributing to farmers’ heavy debt burden, harassment and suicides. A Punjab farmer in his field. Photo by Neil Palmer of CIAT / Fllickr-Wikimedia Commons. The recent centre and state budgets that proposed plans for income support and loan waivers brought little relief. Further disappointment came in the form of, the Congress government in the state not keeping its poll promise of a full loan waiver and the Bharatiya Janata Party (BJP) government at the centre going back on its promise to implement M.S. Swaminathan report, which that recommended that the minimum support price (MSP) of crops be at 50 percent profit above the cost of production. Consequentially, interest in the upcoming general elections and expectations from any new government are low. “All parties treat farmers like beggars who can be thrown crumbs like income support, free power and loan waivers just before elections. What we really need is the right price for our produce; we can take care of the rest,” said Ajmer Singh Rajewal, president, Bharti Kisan Union (Rajewal), one of the prominent farmers’ groups in Punjab. “Party manifestos should become legal documents that these politicians can be held for,” he added. Back in the 2014 elections, Punjab was the only north Indian state where BJP did not have a sweeping win. It won one seat while the then-fledgling Aam Aadmi Party (AAP) secured four Lok Sabha seats – its only success in the general elections. Three of these four seats came from the economically-weaker south Punjab, known for a spate of farm suicides. The last five years, however, saw a decline in the AAP’s fortunes in the state due to infighting and allegations of highhandedness against the central party command. The Congress party, meanwhile, replaced the BJP-Shiromani Akali Dal (Badal) or SAD (B) alliance in the state, winning 77 of the 117 Assembly seats in 2017. The SAD (B) also suffered additional setbacks when many of its senior leaders formed their own separate outfits, blaming party president Sukhbir Badal for bad decision-making. Given the situation and with limited leadership options to choose from, the indifference of the farmers towards the upcoming election is only natural. Addressing the budget session in the Punjab Legislative Assembly on February 18, this year, state finance minister Manpreet Badal claimed that 583,000 marginal and small farmers across the state had been provided relief worth Rs. 47.36 billion (Rs. 4,736 crores) through waiving of crop loans up to Rs. 200,000 under the farm loan waiver scheme. “Waiver for landless farm labourers will be given in the next phase of implementation of this scheme,” he added. But farmers feel cheated. “Before coming to power, Congress had promised to waive off all farm loans, including those owed to private moneylenders. But only loans from banks and cooperative societies are being waived off now,” said Gurtej Singh, a farmer from Mehatpur town in Jalandhar district. “Even the current implementation is tardy as many eligible small farmers have not made it to the beneficiary lists,” he said. Moreover, the terms of loan waiver are incongruent with ground realities. The average landholding in Punjab for each farmer is 3.7 hectares. However, according to the terms of the loan waiver scheme, only those owning 2 hectares or less are eligible for a loan waiver. Also, even for farmers who own less than 2 hectares, the principal and interest due should not exceed Rs. 200,000. However, according to a 2017 study for the Indian Council of Social Science Research done by researchers from Punjabi University, Patiala, and the Dashmesh Khalsa College, Zirakpur, the average amount of farming debt in Punjab is Rs 276,000 for each marginal farmer and Rs. 557,000 for a small farmer. Little wonder the loan waiver scheme has covered only 22 percent of the 2.6 million farmers in Punjab. According to farmers’ unions, 919 farmers and agricultural labourers committed suicide in the state between April 1, 2017 (after the Congress government took charge), and January 31, 2019. Between 2000 and 2017, the number of suicides was over 16,000, according to various surveys that also confirmed economic distress due to debt as the most prominent trigger for the suicides. The suicide rate is highest among marginal farmers and farm labourers as Punjab’s highly-mechanised and competitive agriculture sidelines them. Moreover, banks refuse to issue loans to them in the absence of collateral, forcing them to turn to informal lending sources like big farmers, traders and arhtiyas (commission agents in wholesale markets), who charge high interest rates. Marginal farmers get 40 percent of their loans from informal sources while the figure is 30 percent for small farmers. Many of the areas in Punjab have been overexploited for groundwater used for irrigation of paddy fields. Photo by Manu Moudgil. The Union Consumer Affairs, Food and Public Distribution Ministry recently asked the state government to the abolish arhtiyas network and let farmers sell their produce directly in the markets. Arhtiyas get 2.5 percent of the value of the total crop procurement from wholesale markets. They also supply seeds and fertilizers on credit at the beginning of sowing season, thus consolidating their position in the whole crop cycle. These agents are routinely accused of harassing loan defaulters to the point of suicide. In order to alleviate the situation , the Punjab Settlement of Agricultural Indebtedness Act was passed last year to help regulate the informal loan market by making it compulsory for money lenders to get a license, establish debt settlement forums and a state-level tribunal, and cap the limit of informal loans to be given to farmers based on repayment capacity. The implementation, however, is yet to begin and arhtiyas, as expected, are strongly against these reforms. “Their lobby is very influential since they also raise funds for politicians,” said Jagmohan Singh, general secretary of farmer group Bhartiya Kisan Union Ekta (Dakaunda). The state government’s allotment of Rs. 30 billion (Rs. 3,000 crores) for waiving off loans of landless farm labourers, announced in this year’s budget speech in February, reflects a poor understanding of the situation. Of the total loans taken by farm workers, 92 percent come from informal sources with more than half taken at interest rates above 22 percent, said the Punjab study. In contrast, farmers got most of their loans for interest rates within 14 percent. A few of the marginal and small farmers and farm workers also took loans at more than 29 percent interest rates. “Instead of this fake promise of loan waiver, the government could have ensured proper implementation of the land ceiling law and redistribution of surplus land among landless,” said Zora Singh. “Even the shamlat (common land) in villages, 33 percent of which is reserved for Dalits, is out of bounds as big farmers till it through proxy candidates,” he added, commenting on the practice where the bigger farmers, sponsor a local from the reserved category to bid for the common land at a high rate defeating competition from genuine bidders. The benefits of harvest then go to big farmers. Upper caste Jats dominate the farming landscape in Punjab and only 0.9 percent of the total agricultural land belongs to scheduled castes (SCs) even though they make 32 percent of the population. Over the last few years, Dalits in some villages of Sangrur district fought pitched battles with the police and landlords to take over the shamlat or common village land, which they are now jointly cultivating. Most of the 62,321 hectares of shamlat in Punjab, however, still remain out of reach for them. 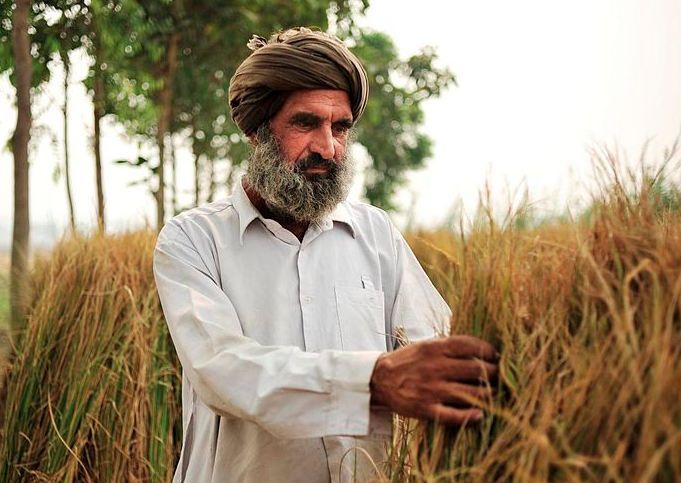 The average monthly income of a Punjab farmer is the highest in the country at Rs. 23,133. The national average is Rs. 8,931, according to the All India Rural Financial Inclusion Survey 2016-17 conducted by the National Bank for Agriculture and Rural Development (NABARD). In this context, most farmers consider the provision of Rs. 6,000 per year as minimum income support for farmers owning up to 2 hectares land under the Pradhan Mantri Kisan Samman Nidhi (announced during the 2019 budget speech), as insignificant. Additionally, the average landholding in Punjab for each farmer is 3.7 hectares and the provision, which is for farmers with land that’s less than two hectares, thus becomes irrelevant. The land lease rate in Punjab currently stands at Rs. 40,000-50,000 an acre (0.4 hectares). The price of diesel, diammonium phosphate (DAP) fertiliser, labour cost, and price of electric motors increased by around 174 percent, 170 percent, 100 percent and 290 percent respectively between 2000 and 2013, said a report of the Niti Aayog task force created to rejuvenate and develop agriculture in Punjab. The MSP of wheat and paddy, the two most valuable crops in Punjab, rose only by 122 percent and 137 percent respectively in the same period. Fall in profits was around 10 percent in wheat and 18 percent in paddy. Water is another factor in the farmers’ debt situation in Punjab. Farmers mostly grow wheat and paddy due to their assured price and ease of procurement since the Green Revolution in 1960s. However, semi-arid Punjab is not a traditionally rice-growing state. The state uses 5,377 litres of water to grow one kilogram of rice, which is double of what the natural rice habitat state, West Bengal uses (2,605 litres for a kilogram), suggest estimates from the Commission for Agricultural Costs and Prices. 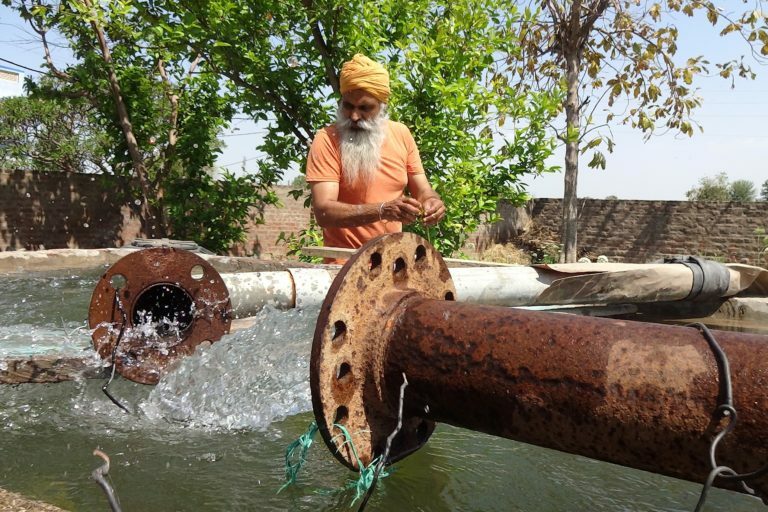 There are, on an average, 34 tube wells per square kilometer of net sown area in Punjab for growing paddy, and 110 out of 148 blocks (district subdivisions) have been over-exploited for groundwater. The state government offers free power for irrigation, but erratic supply forces farmers to use diesel to run submersible water pumps, further increasing the input cost. A deficient monsoon year increases farmers’ dependence on groundwater forcing them to spend extra money on diesel and re-digging of bore wells, which malfunction frequently. The recent state budget reduced the price of diesel by Re 1 in the state and the allocation for free power subsidy has been kept at Rs. 89.69 billion (Rs. 8,969 crores) for 2019-20. On the other hand, the government expenditure on soil and water conservation in 2017-18 saw a major drop of 38 percent over the past year. The share of agriculture and allied services in the total budget dropped from 2.79 percent in 2014-15 to 1.10 percent in 2017-18. While expenditure on forests has been on the rise, the share of agriculture and allied services budget has declined from 2.90 percent in 2014-15 to 1.93 percent in 2017-18. Yet another aspect of the pitfalls of farming in Punjab made headlines during the Delhi smog in the winter of 2016 – burning of paddy stubble in fields. Farmers in Punjab resort to burning the paddy stubble after harvest to clear the stubble because of the very little time between harvesting of paddy and sowing of wheat and also due to the high cost of removing stubble by methods like using tractor-mounted machines that cut and lift the rice straw. Farmers, however, are miffed at being solely held responsible for air pollution even though paddy fields of Haryana and Uttar Pradesh, where the same method is used to clear fields, are closer to the capital. “Other states got much less blame even though their contribution to Delhi smog was higher. The easterly winds should have carried the smoke across the border to Pakistan, but somehow it reached Delhi,” rued Rajewal, particularly unhappy with the centre placing the blame on the Punjab farmers when the case was up in the National Green Tribunal. Stricter monitoring and financial support by both Centre and state governments have helped contain the burning to some extent but it remains unresolved even now. The recent state budget allocated Rs. 3.75 billion (Rs. 375 crores) for crop residue management. On the natural or organic farming front as well, Punjab seems to be lagging behind. It has one of the highest fertiliser consumption rates in India at 221 kg per hectare as compared to the national average of 82 kg per hectare. Pesticide use in the state hovers over 5,700 million tonnes, according to a 2015-16 parliamentary standing committee report on agriculture. In fact, scientific studies have found pesticide residue in blood samples of villagers and contamination of groundwater from excessive use of fertilisers, leading social activists to link high incidence of cancer, genetic disorders among children and other diseases with chemical farming in the state. In order to bring the situation under control, the 2018 draft state farmers’ policy aims at annual reduction of 10 percent in use of agro chemicals. Meanwhile, the state government claims to have brought 8,000 acres (3,237 hectares) under certified organic production. However, farmers feel further incentivisation is needed. “Natural farming comes with lots of challenges, including extra man-hours in the field, initial decline in yield, and absence of a marketing channel,” said Gurmeet Singh, who owns a 10-acre (4.04 hectares) organic farm at Lanjan village of Patiala district. “The government gives a subsidy on chemical fertilisers, it should also support us substantially if it wants to encourage organic farming,” he added. Natural farming also becomes crucial in the face of extreme weather events and future climate change scenarios. 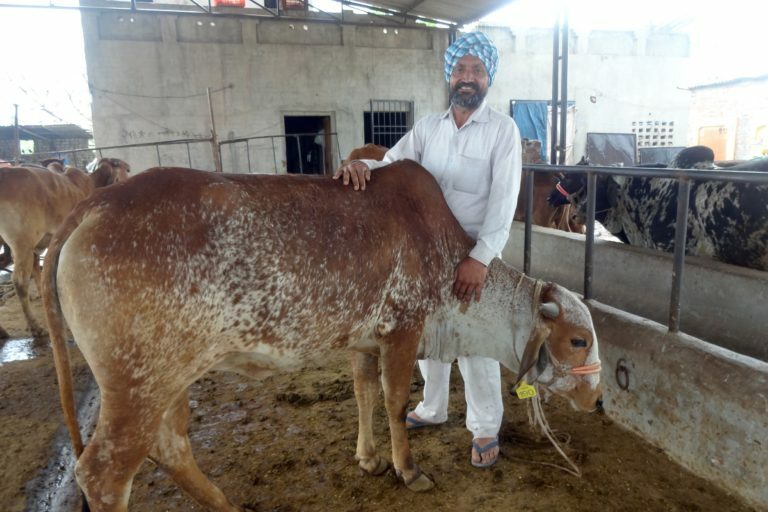 Gurmeet Singh has been doing chemical-free farming besides rearing indigenous cows. Photo by Manu Moudgil. Crop insurance, one of the measures against extreme weather events, is not yet available in Punjab. Political parties and farmers’ unions stiffly opposed the national crop insurance scheme on the grounds that the scheme’s design was more suitable for rainfed areas and does not address issues specific to Punjab’s agriculture. The state government has promised to come up with its own crop insurance scheme. Just another addition to the already long list of promises? One can only wait and watch.